Conservative candidates in Iran's general election have kept control of parliament, in line with expectations. 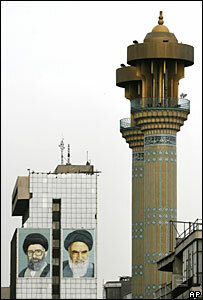 They did particularly well in the capital, Tehran, which is seen as the key to parliamentary power. However, many of the conservative winners are critics of hard-line President Mahmoud Ahmadinejad. Reformists saw a small increase in their representation, despite the disqualification of many of their proposed candidates. They are claiming a relative success, given the circumstances of the poll. The BBC's Jon Leyne in Tehran says that if the new parliament causes problems for Mr Ahmadinejad, this will strengthen the supreme leader, Ayatollah Khamenei. That, he adds, is likely to mean an even tougher line on Iran's nuclear programme and its foreign policy. The conservative critics of Mr Ahmadinejad include the former nuclear negotiator Ali Larijani, who could become the new parliamentary speaker. Our correspondent says there could be quite a battle within the conservative camp to challenge Mr Ahmadinejad in the presidential elections next year. Reformists had said the election was unfair, but still urged voters to turn out for the country's eighth parliamentary elections since the 1979 Islamic revolution. Reformist candidates made up the bulk of about 1,700 candidates barred from running by Iran's Guardian Council - an unelected body of clerics and jurists that vets election candidates. The Guardian Council has denied bias. The Associated Press news agency reports that 188 out of 290 parliamentary seats have been decided so far. Quoting state television and official news agency Irna, AP says pro-Ahmadinejad politicians have won about 70 seats, reformists 31, and conservative critics of Mr Ahmadinejad about 43. Independents whose political leanings were not immediately known claimed 39, the agency says, although reformists said at least 14 of these candidates were pro-reform - which would raise the reformists' number of seats from 40 to 45. The remaining five seats are designated for Iran's Jewish, Zoroastrian and Christian minorities. At least 70 further races are expected to go to run-offs, the agency reported. The EU criticised the conduct of the vote as "neither fair nor free". Washington said Iran's leadership had "cooked" the election by barring reformists. Statistical guide to Iran as it prepares for the parliamentary elections.